Woolly maggots or integral part of our Lake District upland landscape? Sheep divide opinion. The cost of shearing their wool is greater than the value the wool can be sold at. The meat likewise has been re-branded and sold as a local delicacy but sheep farmers would not actually be able to make a living from selling wool and meat at market value. They rely on payments that are paid as part of the agri-environment scheme. Sheep farming is part of the cultural heritage that has shaped the Lake District for many centuries. The dry stone walls, the upland rolling hills characterised by heather, course grass, bracken and bog – these are the harsh conditions in which the hardy Herdwicks and Swaledales thrive. They are so integral to the landscape that it would be difficult to imagine the Lake District without them. 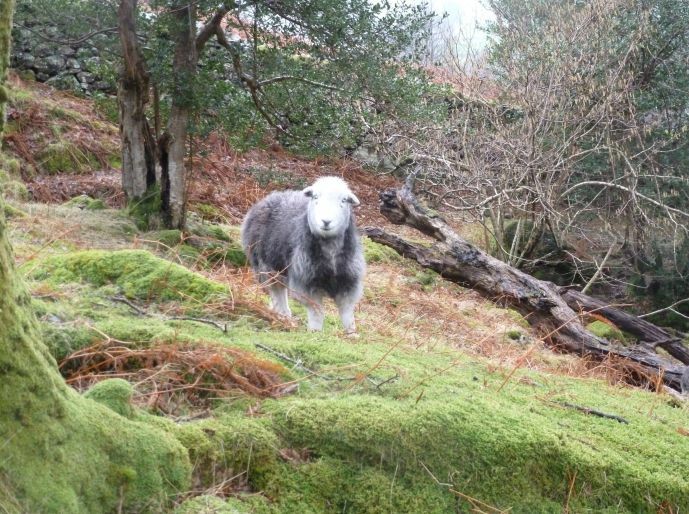 However, opposition to hillside sheep farming, voiced by George Monbiot, states that sheep are “just about the most destructive land use that exists”, pointing out that there is “one sheep to two hectares in some national parks and that’s enough to ensure that not a single tree sapling grows”. However, I have come to realise it is more complicated than sheep nibbling tree seedlings. I bike around the Lake District a lot and I’ve been observing where trees thrive and don’t. Where pine forests have been cleared and brashing left, regeneration is amazingly quick. Birch, ash, alder, mountain ash, the classic succession species, grow within a few years despite high populations of deer that love tree seedlings as much as sheep do. Trees that are planted where grass is well established struggle to thrive. I’ve been reading about this and grass exhibits allelopathy to trees. 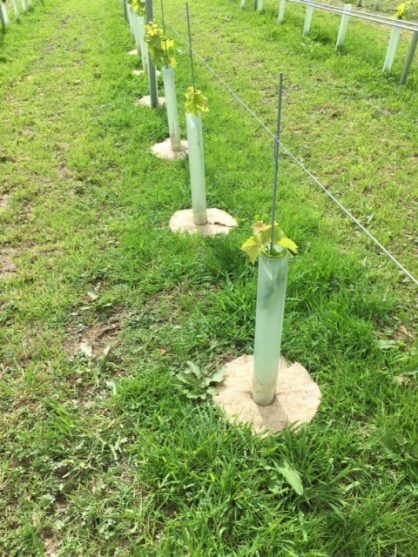 This means that the grass actually releases chemicals that act as herbicides to inhibit the young trees. 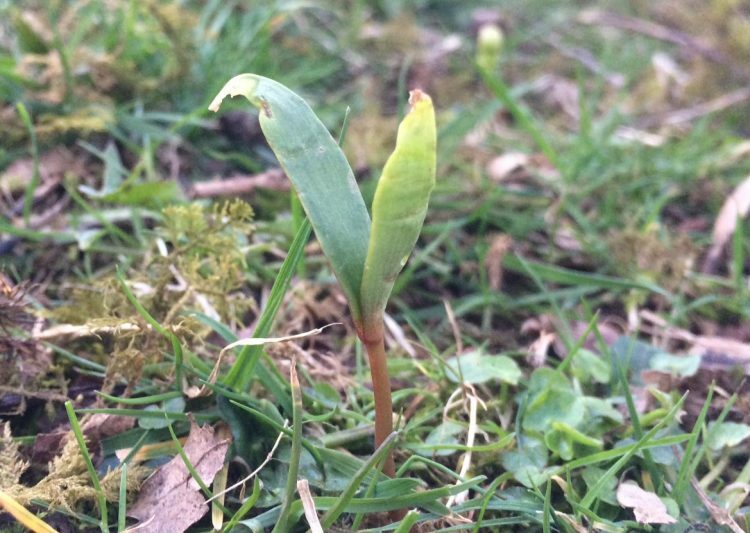 Watch sycamore seedlings in a park. In early spring there are thousands of them, but once the grass gets going the seedlings perish (and not just because of lawn-mowers, watch them on the edges where the mowers don’t reach). In early spring saplings like these are a common sight, but as the grass starts growing it out-competes the seedlings and these disappear. This landscape has regenerated around 7 years after being clear-felled. There are deer-trails through the woodland but the trees have self-seeded densely enough for them to withstand deer grazing. This landscape is dominated by grass and rushes, with hardly a tree in sight. It is grazed by sheep, but they are not solely to blame for the lack of trees. 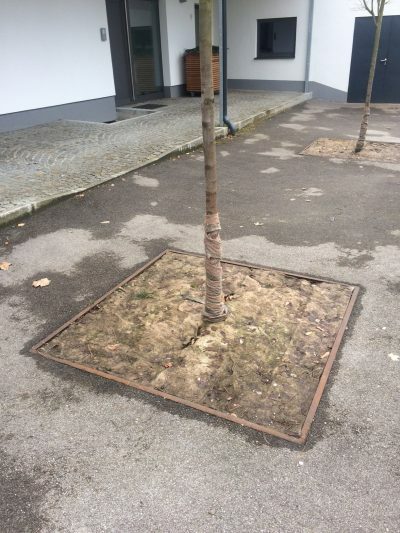 What conditions do trees thrive in? The fells were cleared of trees for industrial reasons, for ship building then lead smelting then the iron industry. The sheep are efficient grass-maintainers. But they don’t necessarily eat the trees. Where the trees get a chance to develop, they can eat around them. A parkland type habitat is good for all, and quite natural. It doesn’t have to be one or the other. We use Herdwick wool for our chimney draught excluders, and began experimenting with the off-cuts. It makes a perfect weed suppressant, inhibiting the growth of grass around the base of saplings and tender plants. It also protects the plants against frost, retains water in the soil, retains warmth, and slowly biodegrades to introduce nutrients to the soil. Plants that have the wool heaped around them noticeably thrive. They even seem to do better against the onslaught of slugs and snails. This led to the development of a range of natural garden products. We get a lot of off-cuts from making the Chimney Sheeps. We chop these up even smaller and they resemble slate gravel or “shillies”. These can be heaped around delicate plants as protective mulch and we’ve used them successfully both on individual pot plants and across full vegetable patches. If you water them with garlic infusion you can create an efficient anti-slug barrier. 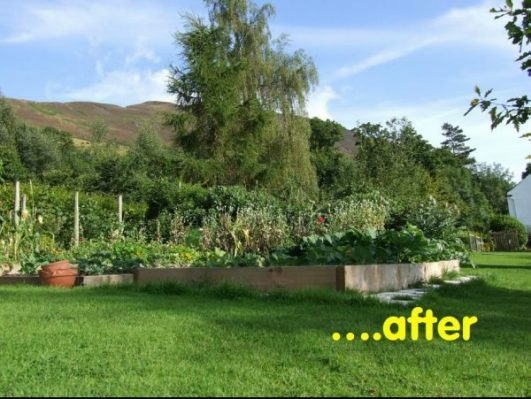 We’ve been given a tried and tested recipe by the Lakeland Horticultural Society which they use at their flagship gardens at Holehird near Windermere. Most mulch mats on the market are made of synthetic material. Ours are 100% felted jute. They are 13.5” / 35cm in diameter and fit snugly round young saplings or larger tender plants. They provide a durable protective barrier that lasts around a year. 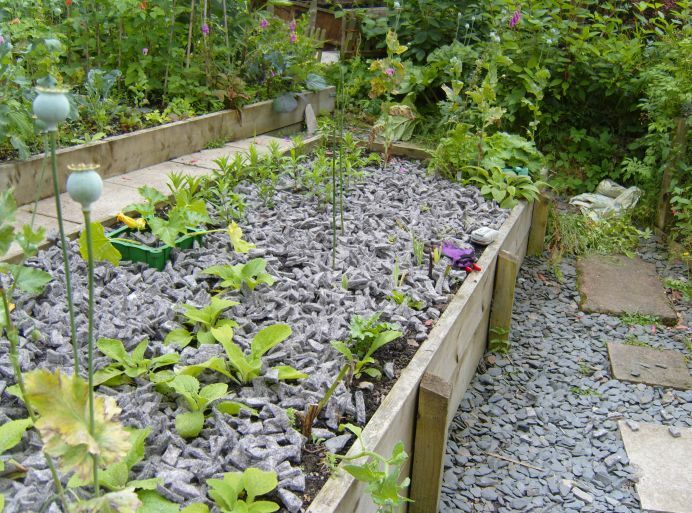 Over that period the mulch mat will keep weeds and competitive grass away from the roots of the plant, retain moisture, deter slugs and snails, protect the plant from winter frosts, and as it biodegrades, add nutrients to the soil. It can also be impregnated with slow release fertiliser such as liquid seaweed, so this can be targeted to the plant that needs it rather than dissipating out to all plants and weeds. We’ve also got a range of smaller mulch mats that fit neatly onto individual plant pots: perfect for nurturing and protecting precious seedlings. We’ve got some wool felt made of mixed wool on jute. It’s brilliant for mulching larger areas, or you can cut your own mulch mats for individual potted plants. 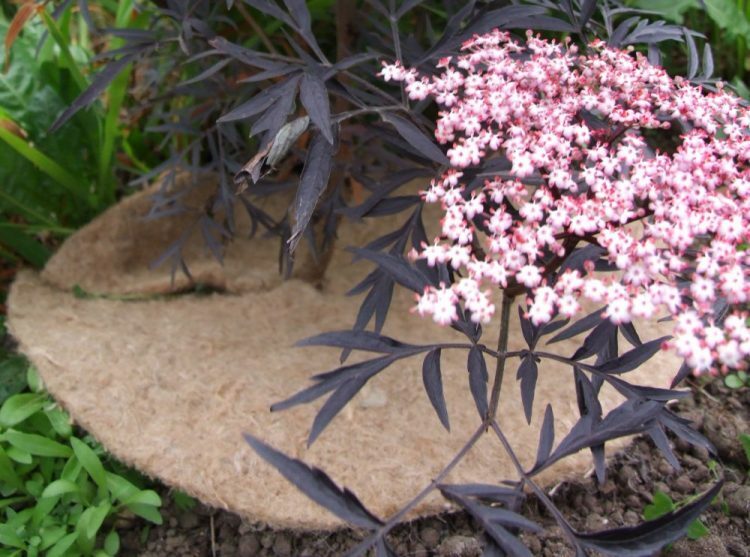 It also works well as capillary matting – put a collection of potted plants on it in the greenhouse, and the wool will absorb moisture and let it be absorbed up into the compost as the plants require it. 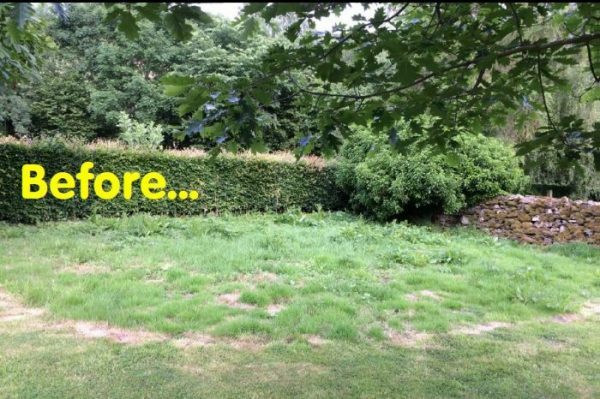 Before and after: use larger lengths of wool felt to supress grass and weeds to create large beds or tidy up more extensive parts of the garden. Lay the felt over the grass area, add topsoil or compost, then plant on top. The roots of the new plants will break up the ground underneath to create drainage, and the wool will supress the unwanted plants, causing them to rot. Eventually the wool will provide nutrients for the new plants. Without the layer of wool the grass and weeds would quickly grow up through the topsoil. 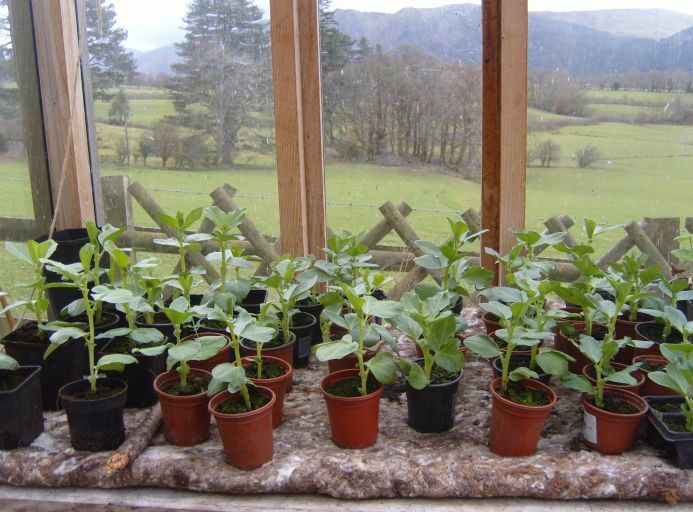 These happy little broad bean plants are sitting on wool felt capillary matting.